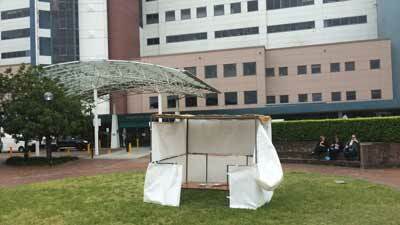 The first Jewish patient to spot the Sukkah constructed in the grounds of Sydney’s Prince of Wales Hospital by Jewish House was Gary Cohen…the president of the care organisation. Rabbi Mendel Kastel, CEO of Jewish House and Jewish Chaplain at the hospital , said he was happy to “bring yomtov to people in hospital”. For those too sick to make it downstairs to the forecourt where he built the Sukkah , the rabbi took a lulav and etrog to patients in their rooms. President Gary Cohen had been attending the emergency section of the hospital and is not an in-house patient. J-Wire accompanied Rabbi Kastel on his rounds and witnessed the great pleasure patients experienced in making the mitzvah of reciting the blessings or viewing the succah on the hospital grounds. There are more than 50 patients in the hospital registered as being Jewish. 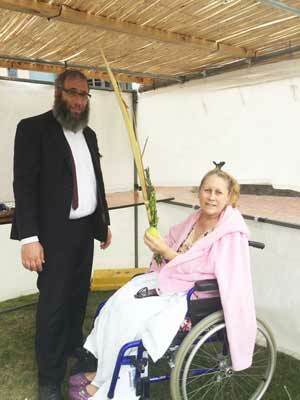 Aviva Magid accompanied Rabbi Kastel to the succah where she recited the blessings holding the lulav and etrog.